In Llandovery, Wenlock and Ludlow times the Geopark was still under water with sediments being deposited in the Iapetus Ocean. In these oceans lived the marine creatures such as brachiopods which allowed Murchinson to define the period and its stages. However from the mid Silurian onwards the Iapetus was closing. England and Wales part of the ancient micro-continent of Avalonia were colliding with Scotland which was part of the ancient continent of Laurentia. This started to form a huge chain of mountains, the Caledonian Mountains, and uplifted the rocks of the Geopark area out of the sea. By the latest Silurian, the Pridoli, all the sedimentation taking place f England and Wales was terrestrial; this is why a site in the Czech Republic defines this age because it was still marine and consequently preserves marine fossils. The rocks deposited in the Geopark of Pridoli age are the Raglan Mudstones. They are red in colour and are part of the Old Red Sandstone that continued to be deposited throughout the Devonian, the period that succeeds the Silurian. The global stratotypes of the Telychian and Aeronian are on private land but a great and accessible place within the Geopark to look at Silurian rocks is the Sawdde Gorge. This site is an SSSI due to the geology. 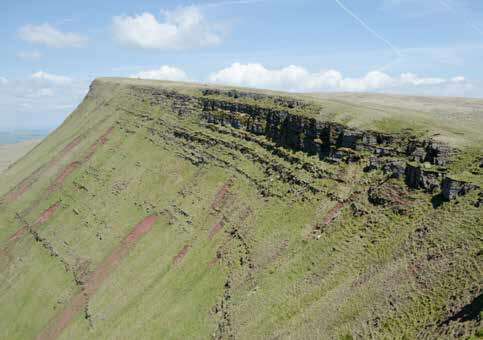 Here the transition from the marine conditions in the Ludlow to the terrestrial conditions in the Pridoli can be seen. The Ludlow sediments from the quarry here have also yielded some of the earliest known fossils of a primitive fish.